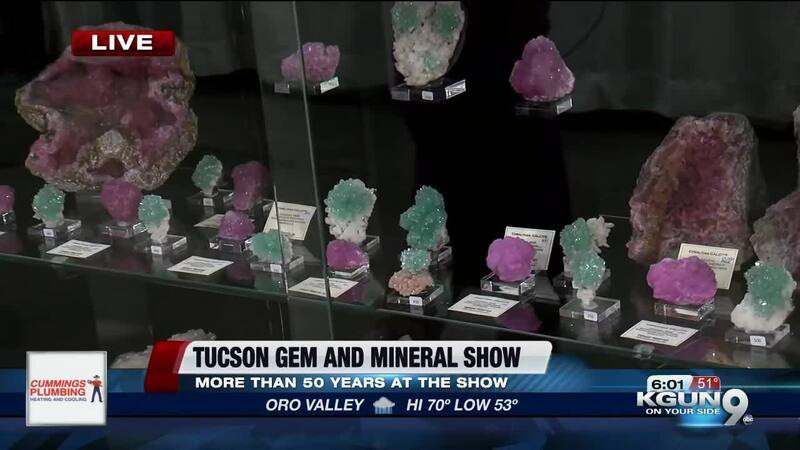 The doors to the Tucson Gem and Mineral Show at the Tucson Convention Center are officially opening up on Thursday, February 14, marking the 56th year one gem and mineral dealer has visited. TUCSON, Ariz. - The doors to the Tucson Gem and Mineral Show at the Tucson Convention Center are officially opening up on Thursday, February 14, marking the 56th year one gem and mineral dealer has visited. Les Presmyk went to his first Tucson Gem and Mineral Show back in 1963 at just 11 years old. At that time the show was held at the Pima County Fairgrounds. "So this is truly part of my life. I have been coming for 55 straight years since I was 11 years old," Presmyk said. For years Presmyk simply stopped by as an admirer, closely looking at everything the show had to offer. "I think I had all of 10 dollars to spend and I spent it all. That was my birthday money for that year," he said. Years later Presmyk would, instead of looking from the outside in, be a part of the show as a whole. "So a friend of mine and I rented a room at the desert inn, I'd come down to the room and open it up after I was done with classes at the UA and just sit there and do my homework and sell minerals for a few days," Presmyk said. Years after that he vas invited to be a part of the Tucson Gem and Mineral Show inside of the Tucson Convention Center, accepting gladly. A show that once started out with 26 dealers now welcomes more than 200 every single year. As for Presmyk himself, his focus is on Arizona minerals, like Wulfonite among other things. "The most fun that we have in our booth is we also crack geodes," said Presmyk. Presmyk added he plans on returning to the Tucson Gem and Mineral show for another 56 years, as long as his wife is by his side.